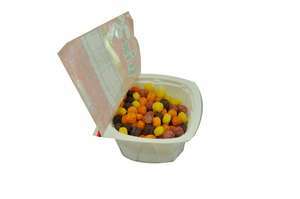 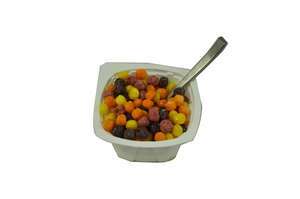 A fruit flavored, sweetened corn puff cereal using natural color extract from blueberries, purple carrots, and tumeric in a ready-to-eat bowl for convenient, portion control. 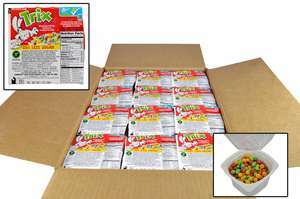 Meets 1 ounce equivalent grain and whole grain-rich criteria. 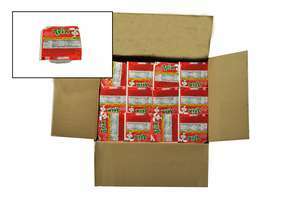 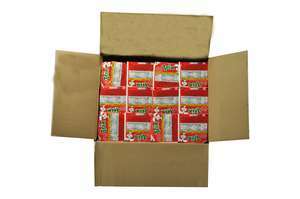 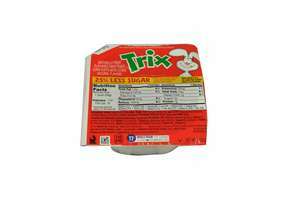 Whole Grain Corn, Corn Meal, Sugar, Corn Syrup, Canola Oil, Salt, Color (vegetable and fruit juice, turmeric extract, annatto extract), Trisodium Phosphate, Natural Flavor, Citric Acid, Malic Acid. 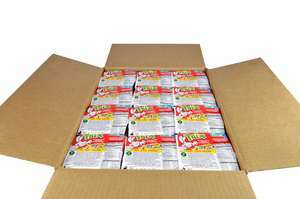 Vitamins and Minerals: Calcium Carbonate, Tricalcium Phosphate,Iron and Zinc (mineral nutrients), Vitamin C (sodium ascorbate), A B Vitamin (niacinamide), Vitamin B6 (pyridoxine hydrochloride),Vitamin B1 (thiamin mononitrate), Vitamin A (palmitate), Vitamin B2 (riboflavin), A B Vitamin (folic acid), Vitamin B12, Vitamin D3. 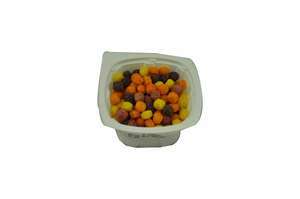 Ready to eat dry cereal in a portable, easy-to-serve bowl. 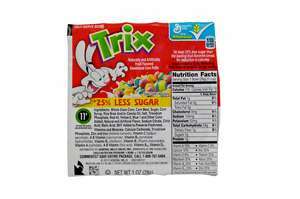 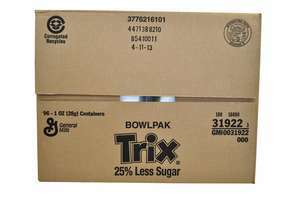 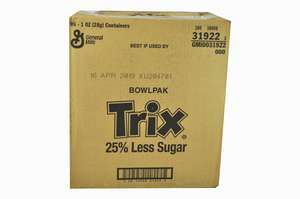 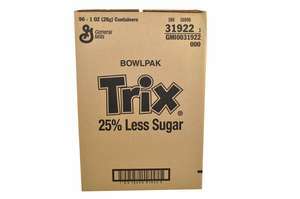 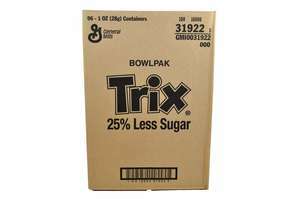 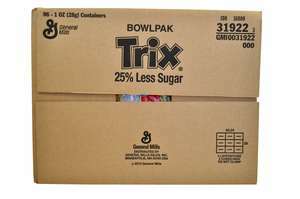 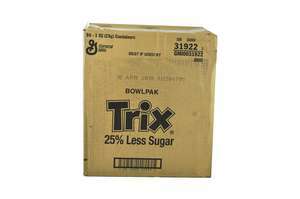 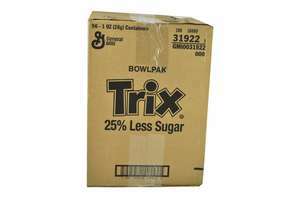 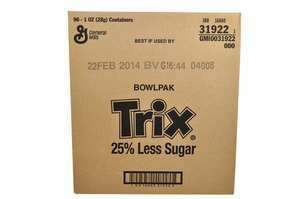 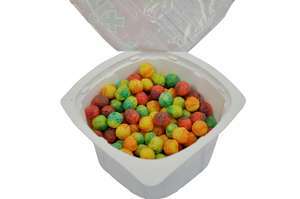 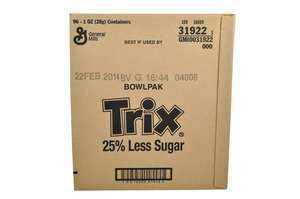 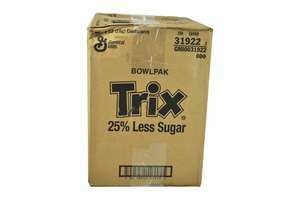 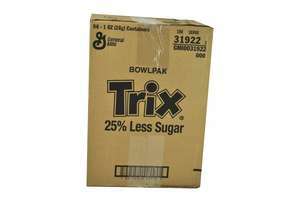 For fun colors, Trix use extract from blueberries, purple carrots, and tumeric. 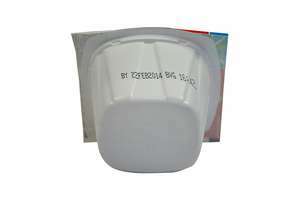 Great for use in K-12 schools and healthcare.